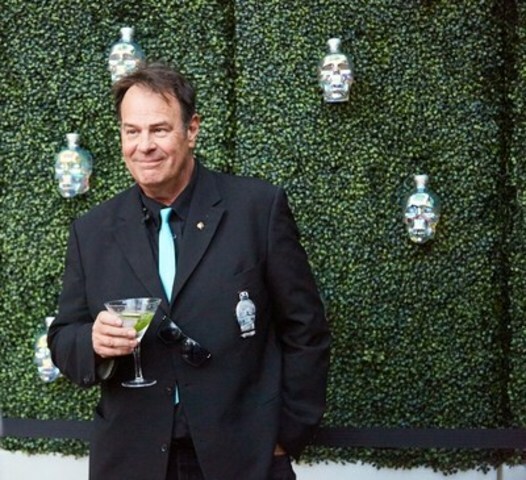 TORONTO, July 19, 2016 /CNW/ - On Tuesday, Dan Aykroyd rode up to the Berkeley Bicycle Club on a motorcycle and was greeted by more than 150 Canadians, anxious to meet the man and taste his newest vodka, Crystal Head AURORA. Inspired by the Aurora Borealis, Dan showcased his iconic skull-shaped bottle with an iridescent design to celebrate the most vivid aerial phenomenon in the world. Explaining that no two bottles are alike due to the original decorative finish, guests reveled in the bottle's beauty. Not to be outmatched, the vodka inside the bottle is equally as impressive, having already won a gold medal for excellent taste from the prestigious San Francisco World Spirits Competition 2016. Dan boasts "our ultra-premium vodka is one of the cleanest vodkas you'll ever taste as we don't use any additives such as sugar, citrus oils, or glycerol to mask or enhance the flavours. We don't now, nor will we ever use any of these additives." Crystal Head AURORA is only crafted with the purest ingredients, including high quality English-grown wheat from North Yorkshire and the pristine water from St. John's, Newfoundland. It's five-times distilled and seven-times filtered, with three of the filtrations passing through layers of Herkimer diamonds. Unlike the original Crystal Head, which offers a touch of sweetness from the peaches and cream corn, AURORA offers a drier, bolder and spicier taste as a result of the wheat, staying true to the Crystal Head house-style. Guests at the launch event were enamoured with the new vodka and the stunning ambiance. They indulged in skull shaped chocolates and cake-pops under a man-made Aurora Borealis, while sipping on deconstructed martinis and cocktails. Well-known graffiti artist Nathan Rooyakkers spray painted the iconic skull on a canvas while guests spray painted their own Crystal Head designs on original bottles, judged by Crystal Head bottle designer, John Alexander. "Crystal Head AURORA boasts one of the most striking bottles to hit Canadian shelves, while offering an ultra-premium, additive-free liquid that is as bold and spicy as it is smooth," said Jonathan Hemi, president of Globefill Inc., the owners of Crystal Head Vodka. Crystal Head AURORA is now available nationwide, retailing for approximately $79.90 for a 750ml bottle. Enjoyed neat, as a shot, on the rocks or in a cocktail, Crystal Head Vodka reminds you to enjoy AURORA responsibly. Pour Crystal Head AURORA and lemonade into a mug; add Fever Tree Ginger Beer and ice cubes. Stir to combine. Garnish with smoked oranges. In a cocktail shaker, muddle Crystal Head AURORA and fresh watermelon cubes. Add cranberry, lime juice and simple syrup. Fill with ice and shake. Pour into glass. In a cocktail shaker, muddle basil, cucumber and Crystal Head. Add lime juice and Qcumber water. Fill with ice and shake. Pour into glass and top with Belvoir Sparking Elderflower Water. Garnish with Buzz Button. Crystal Head Vodka was founded in 2008 by actor, musician, and entrepreneur, Dan Aykroyd. Crystal Head Vodka is now sold in more than 55 countries around the world. Globefill Inc. is the owner and manufacturer of Crystal Head Vodka. The majority owner of Globefill Inc. is Dan Aykroyd. Crystal Head Vodka is an award-winning, ultra-premium beverage produced in Newfoundland, Canada. Additional information on the privately-held corporation may be found at www.crystalheadvodka.com and www.facebook.com/crystalheadvodka. The Crystal Head AURORA launch event was hosted at the Berkeley Bicycle Club in Toronto. A crown fit for a king! Crystal Head AURORA wore a one-of-a-kind, hand carved crown stopper set with more than 100 precious stones including black diamonds, emeralds and rubies in an 18 carat gold plate. Designed by The Great Frog for AURORA. Dan Aykroyd mingled with guests at the Crystal Head AURORA launch event. Signature cocktails and deconstructed martinis were served at the launch event for Crystal Head AURORA. Crystal Head AURORA sits next to the original Crystal Head Vodka, showcasing its beautiful iridescent finish which pays homage to the Aurora Borealis. Pouring AURORA for guests under a man-made Aurora Borealis. Crystal Head infused chocolate covered strawberries were a favourite among guests. Dan Aykroyd samples the skulls shaped chocolates and cake-pops. Guests at the Crystal Head AURORA launch event decorated their own bottles. Crystal Head bottle designer John Alexander poses with the three guests he declared winners for the best bottle designs. The Crystal Head Vodka bottle plays many roles long after the vodka is gone. Graffiti artist Nathan Rooyakkers from Spudbomb recreates the iconic bottle on a canvas. Guests line up at one of the four bars at the AURORA launch event. Guests gather to hear Dan Aykroyd speak. Dan Aykroyd thanks guests for attending and shows why he’s still a comedian at heart as awell as a majority owner of Crystal Head Vodka since 2008.